Here's a simple visual exercise you can do to get a better feel for the approximate living area inside one of our amazingly complex and now-retired space shuttles. You'll need three adults. Have them stand in a row facing an audience. Now, have the adult in the middle turn sideways (they will be perpendicular to the audience). Then, have all three of them extend their arms directly outward from their sides; they should look like "crosses" or X's. Ensure that the two outside adults' fingertips just touch the chest or back of the adult in the center. Now, imagine that you build a wall around our adults standing "in formation." The back wall would just touch the middle adult's extended fingertips, the two side walls would just touch the fingertips of the two adults still facing the audience. Imagine a windshield at the fingertips of the adult's arm pointing to the audience, and you now have a rough estimate of the area of the space shuttle cockpit. Double this size, as the shuttle has a first floor (the flight deck) and a second floor (the middeck). Finally, have all three adults stand on their tip toes. Note the tops of their heads as this is close to the ceiling height of our make-believe space shuttle living quarters. Of course in zero-gravity (or near-zero-gravity), we can live in that space too; we don't have to be limited like our Earth-bound demonstrators. I use this idea when I talk to elementary school children while sharing the dream of STEAM education (science, technology, engineering, arts and math). It's a great way to give them perspective of what it's like to have 7 adults living in space for 6-14 days on a shuttle. About the author: Clayton C. Anderson is a two-time ISS astronaut, a six-time space walker, and a 30-year (now retired) NASA employee. You can follow him on Twitter here or find more at his website here. 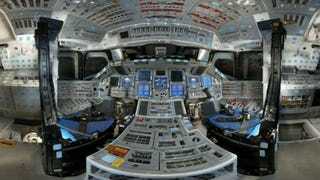 How Cramped Is It Inside a Space Shuttle? originally appeared on Quora. You can follow Quora on Twitter,Facebook, and Google+.